Nihi Sumba, a remote hideaway located on the Indonesian island of Sumba, is raising the bar for wellness escapes this spring with the launch of three brand new experiences. Tapping into 2019’s hottest wellness trends, guests will discover the secrets behind breath awareness, find unrivalled solitude in a remote ‘castaway’ experience and improve fitness with their choice of three new retreats. Each of these experiences make the most of Sumba’s unique wilderness and total isolation, being the only luxury hotel on the island and allowing guests to escape both mentally and physically. For those seeking a few nights of complete seclusion and privacy, Nihi guests can now add on the ‘Villa Rahasia’ experience. Rahasia is a private villa hidden within the remote Nihioka Valley, on its own piece of the island where the signature NihiOka Spa Safari takes place. Translating to ‘secret’ in Indonesian, guests are literally the only occupant for miles. The journey to this remote villa begins with a sunrise trek across Sumba’s dramatic west coast and through rice paddies to the secluded NihiOka Valley. Staff await bearing scented towels, fresh coconuts and a bush-cooked breakfast served in a treehouse. The remote set-up is castaway, the villa is tropical chic and the scenery raw, wild and removed from civilisation. 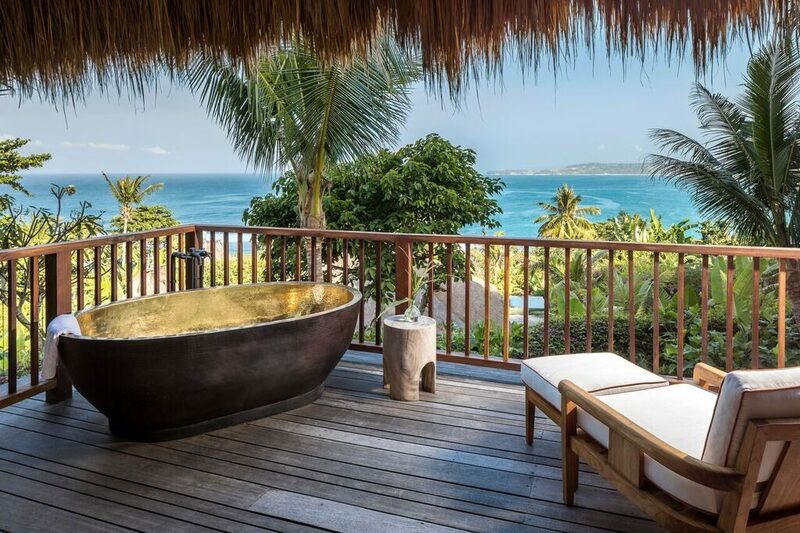 After breakfast, guests are shown to their own private bale, which boasts expansive views of the Indian Ocean. Here, guests enjoy unlimited spa treatments, ranging from facials with ingredients harvested from the island such as coconut oil, mint leaves, green tea and red rice to treatments such as reflexology, deep tissue massage and Indonesian ‘Lulur’ body exfoliations, which are regarded as traditional medicine. There is a freshwater pool, a private cove and spa sanctuary, which comes with a daybed. As the sun sets, guests will then retreat to Villa Rahasia. The Sumbanese-inspired one-bedroom villa overlooks the Indian Ocean and is totally isolated from civilisation. The Sumba Warrior Retreat is designed for those seeking an adventure-filled retreat and health benefits in a unique setting. Highlights include: healthy menus, yoga classes on the hotel’s hilltop pavilion (incorporating strength training exercises and cardio bursts), a free-diving workshop with Nihi’s resident instructor, a sunrise jog from beach to bush, arriving at an awe-inspiring island hidden in the Rice Terraces for a picnic breakfast and the signature NihiOka Spa Safari – jogging through the scenic landscapes of Sumba past wild water buffalo, local villages to finally arrive at the NihiOka peninsula. The God’s Left Surf & Yoga Retreat is designed to keep guests energised and balanced for Nihi’s world-class waves. The mile and a half long beach on Nihi’s doorstep fronts Occy’s Left, one of the world’s great surfing waves, (which exclusively accommodates only 10 surfers at any one time) and is exclusively available to Nihi guests. The retreat includes private surf lesson’s with Nihi’s Tropic Surf Guide, personalised yoga practice to prepare and restore the body for surf, breathing sessions to maximise breath holds and reduce tension in the body, daily massages to relax muscles, protein-rich menus and photography masterclasses to capture epic moments on the waves. The Nihi Nourish retreat is for those seeking to learn more about Indonesian wellness and nutrition. The program feeds the body, mind and soul by rebooting the immune system with a nourishing meal plan and daily routine which reenergises and restores. The programme will begin with a private consultation with Nihi’s resident yoga instructor and includes personalised yoga and meditation sessions, a raw cacao facial from locally sourced cacao beans used to stimulate blood flow leaving a healthy glow and nourishing properties cocoa butter and coconut oil in addition to the signature NihiOka Spa Safari.